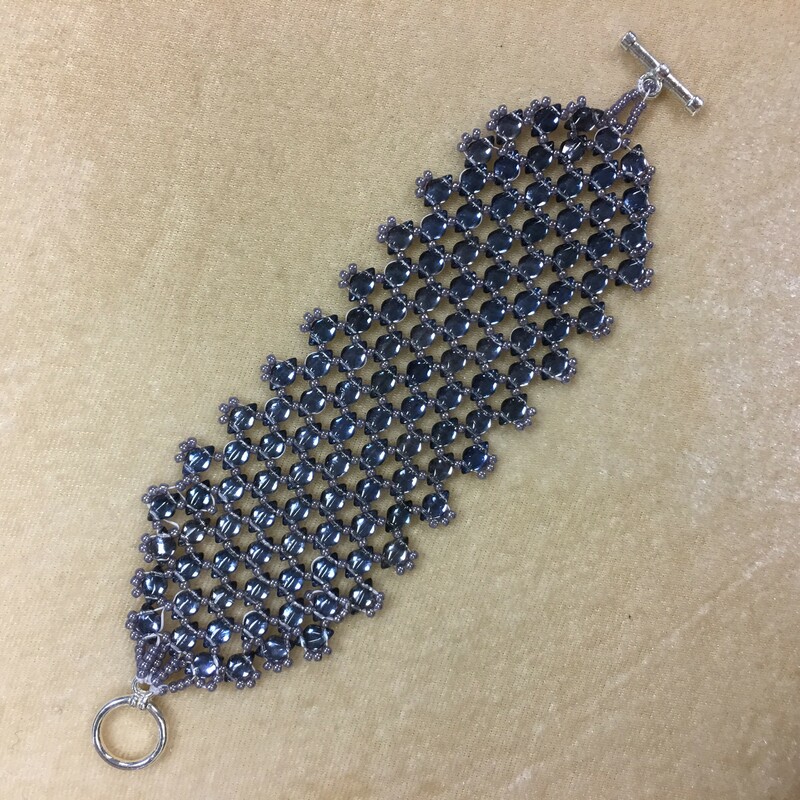 Learn how to make this beautiful fish scale looking bracelet ideal for festive events such as Christmas parties to glam up your winter gowns. 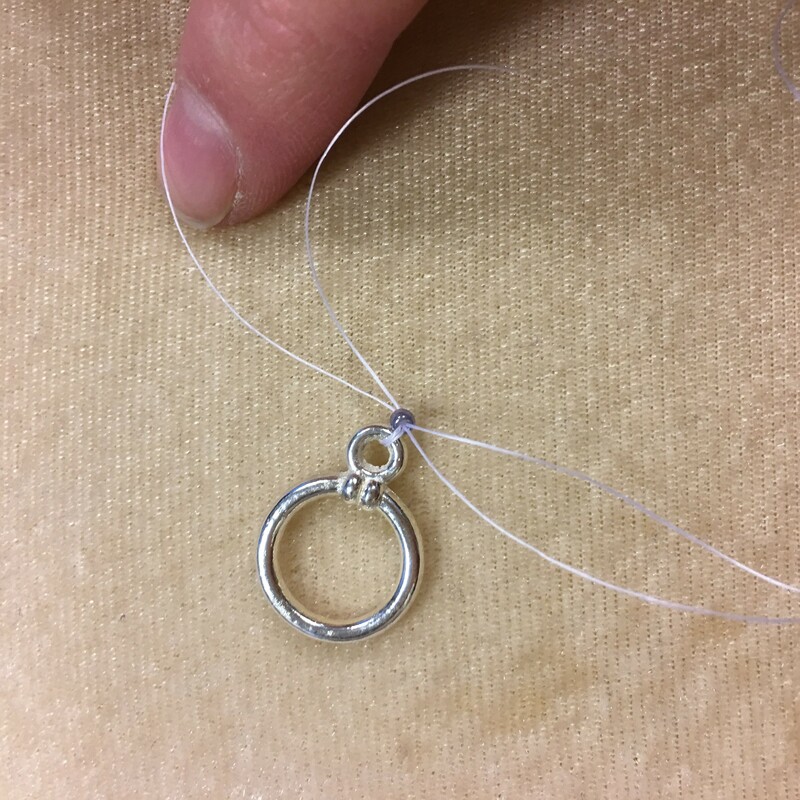 Cut a length of KO thread measuring approx 50cm. 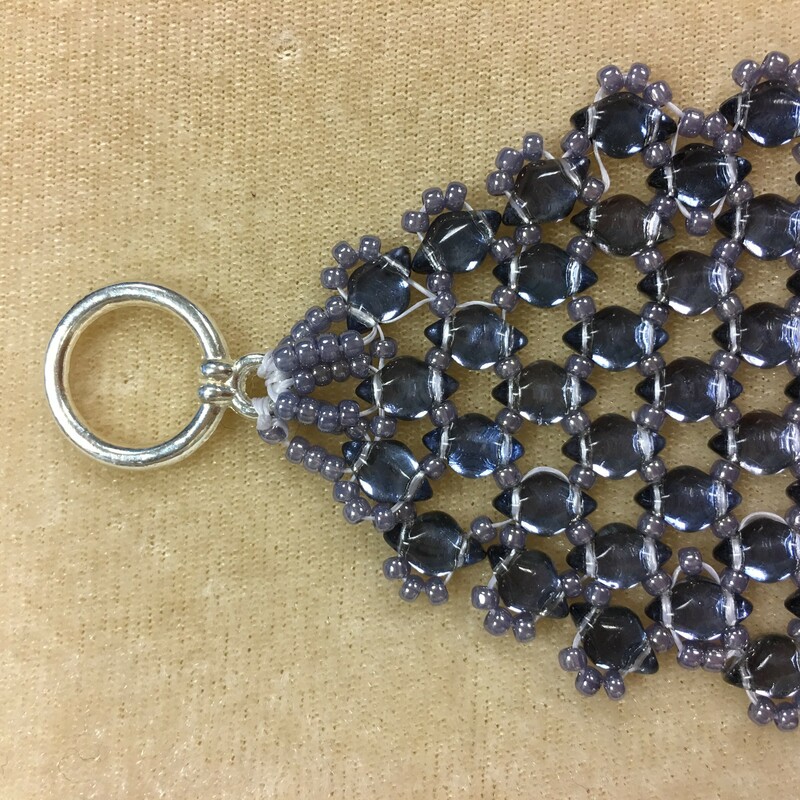 Hook a seed bead on and add your round end of the toggle. 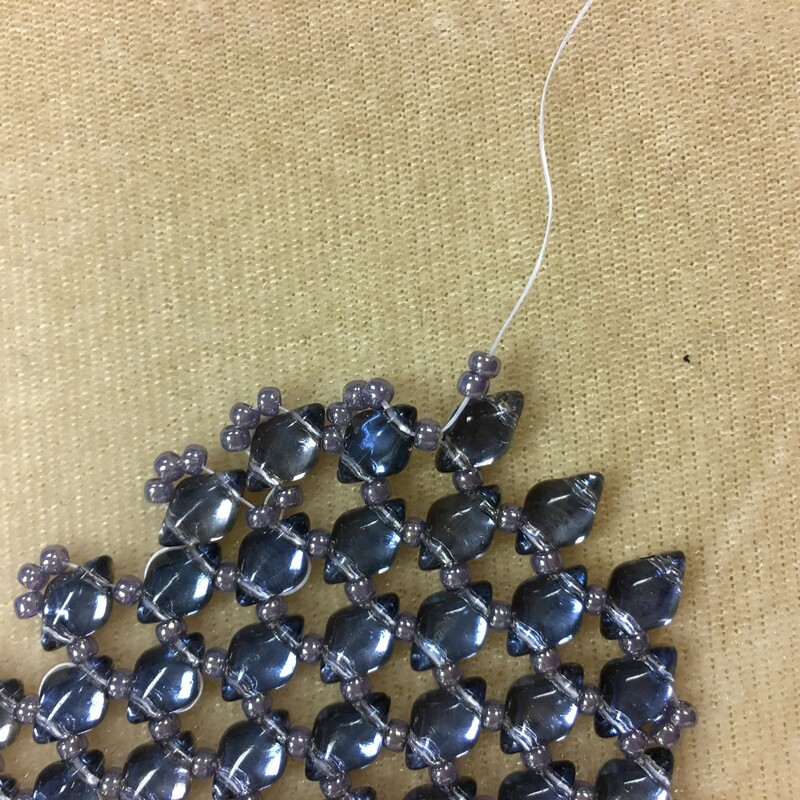 Thread back through the seed bead and tie a knot before starting the next step. Do not cut the KO thread. 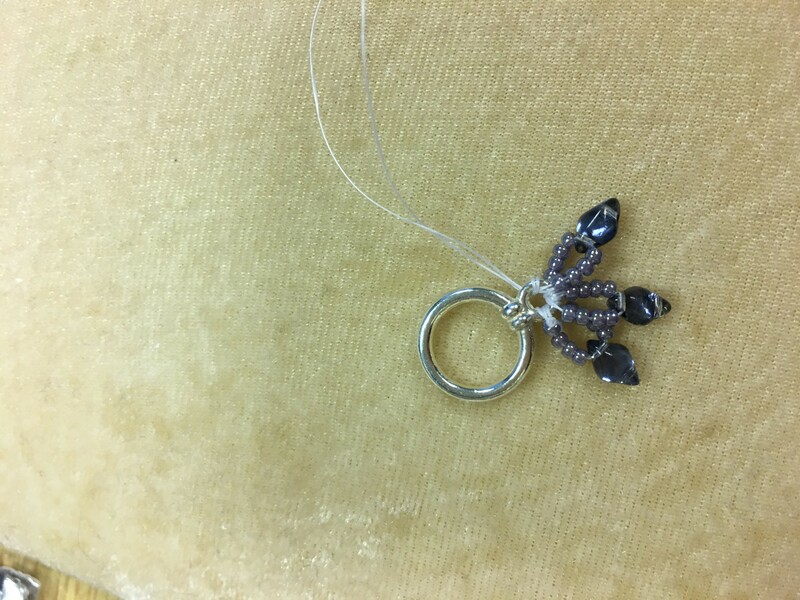 Now take four seed beads and one of your gem duo beads then another four seed beads, loop back through the toggle hoop and tie a knot. Repeat this step three times until you have three of the same seed bead/gem duo loops. 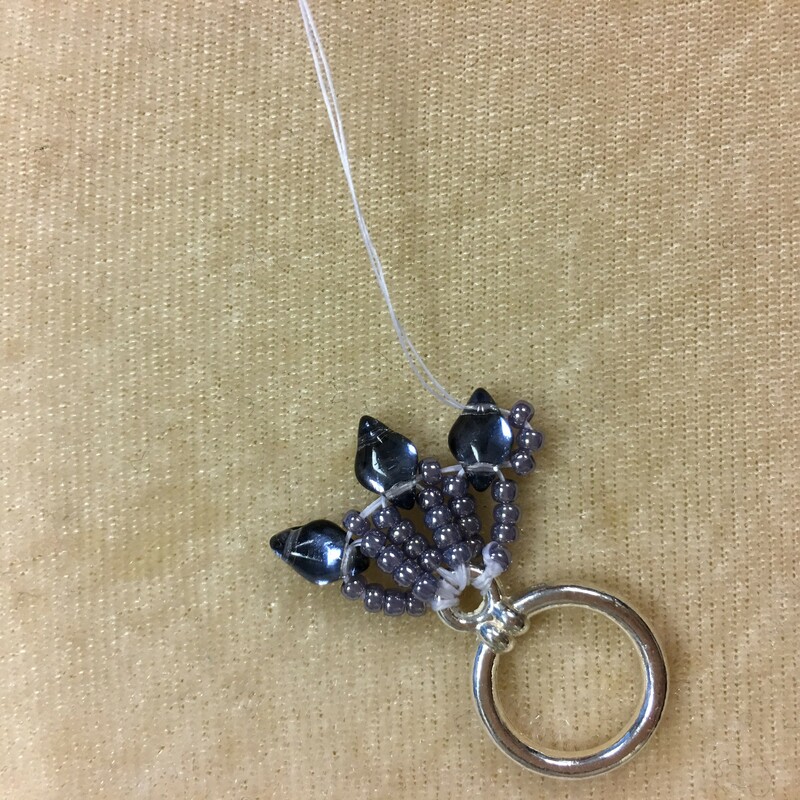 Now thread back through your four end seed beads and back through your gem duo, add a seed bead, thread through your gem duo, add a seed bead and back through you last gem duo before adding another seed bead. 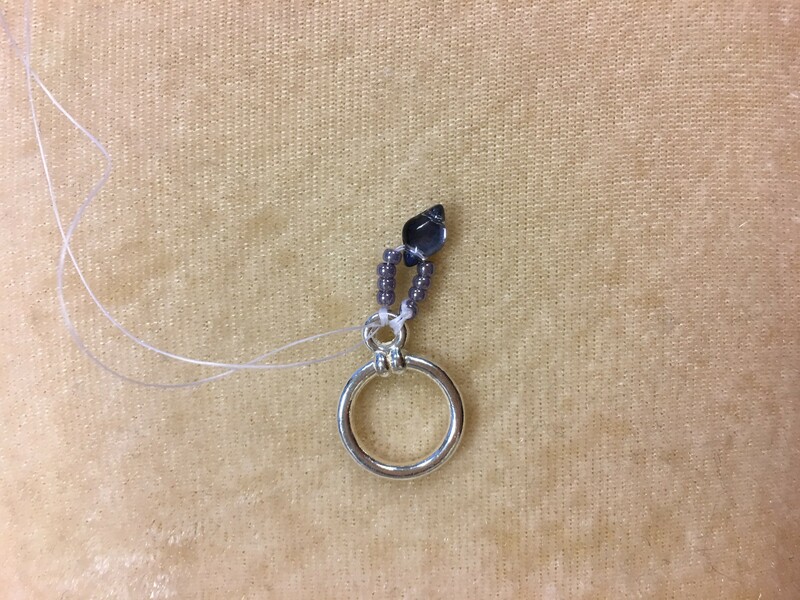 Add two more seed beads around the edge of you gem duo and thread through the bottom hole of your gem duo. 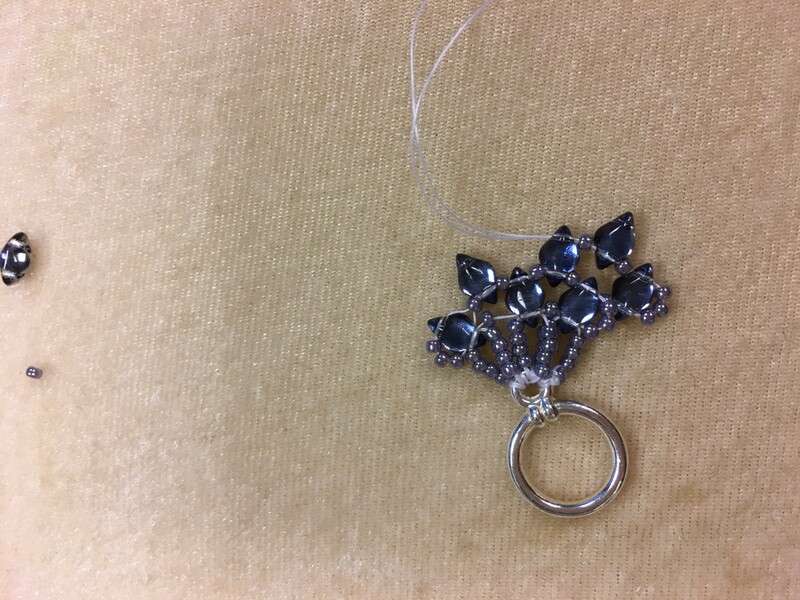 Add a seed bead, then a gem duo, then a seed bead, then thread through your bottom hole on the gem duo above, then a seed bead and a gem duo and add three seed beads around the edge before continuing on the next row. Keep this routine in place and repeat until you get to six gem duo's in a row, this is where the pattern changes and the next row will drop to five gem duo's. 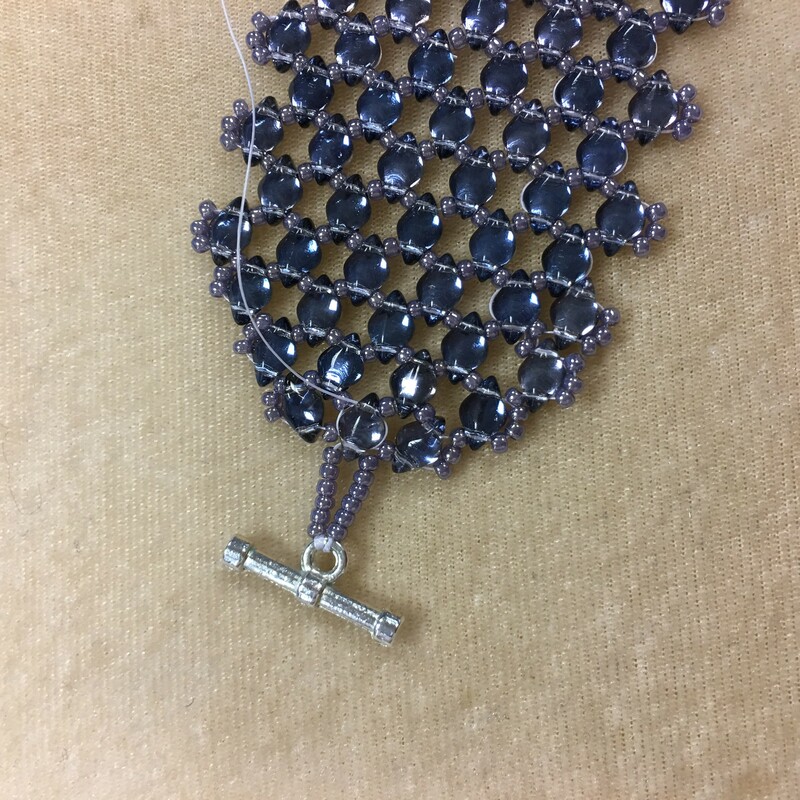 The row's with the five gem duo's will not have the three seed beads on the end of each row. 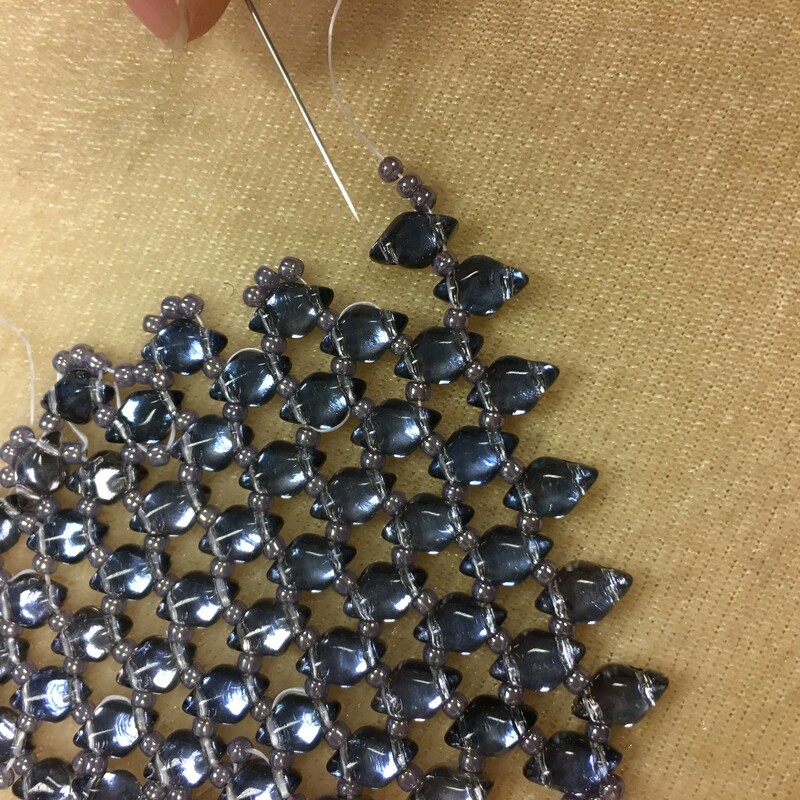 The rows with six gem duo's will have the three seed beads. Continue this pattern all the way down until you have enough of the bracelet to fit most of your wrist, this is when the beads need to narrow again at the bottom. 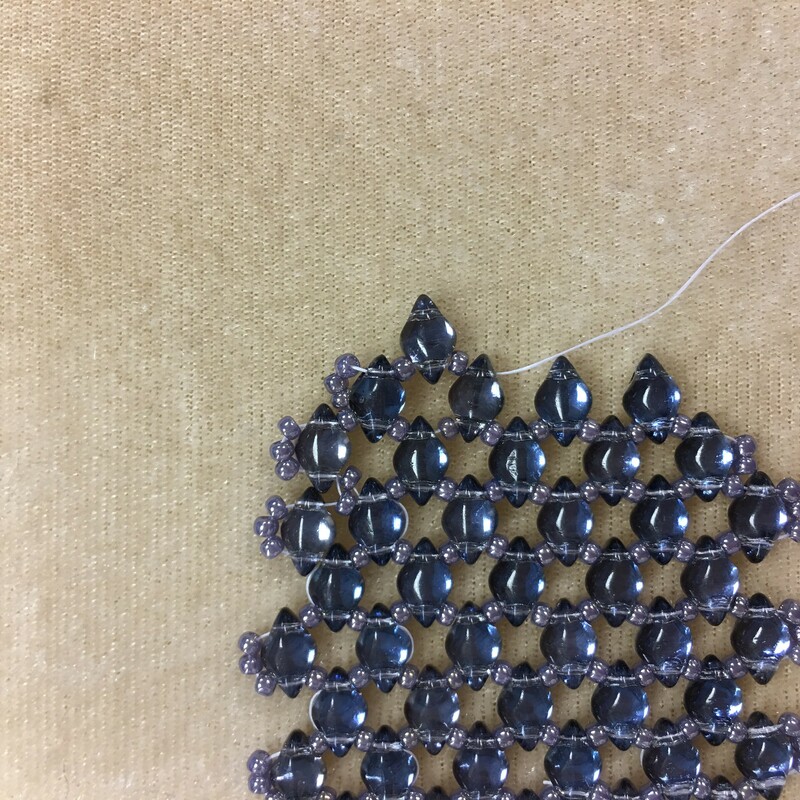 If you can see by the fourth and fifth image on this step when you get to the end of each row to stop the end beads flapping about you have to go back on yourself upwards again and secure within the row above and then come back down to continue with your next row. When you get to your last row of five, its time to bring in your bracelet and make it narrower again to end it. This can be done but decreasing your gem duo's each time from five to four, four to three in the same pattern used before and then attaching your other end of the toggle. 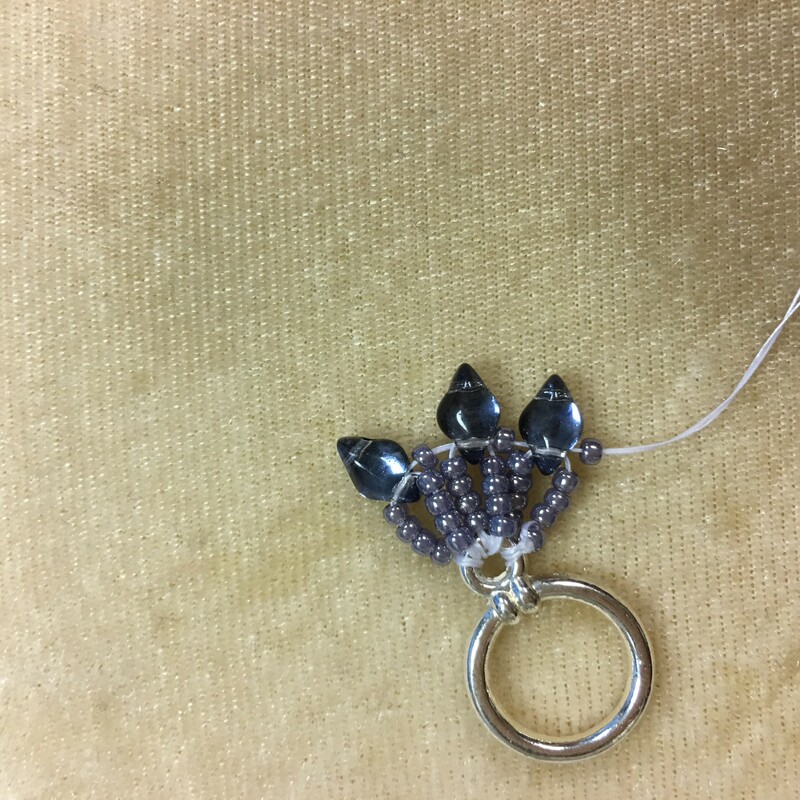 Once you have got to the end and there are three gem duo's, you need to thread through so you are one side of the middle gem duo and thread on six seed beads, add the other end of the toggle and tie off, not cutting the thread add another six seed beads and thread back through your centre gem duo.